Polish Ambassador, Senator to Talk at W&L In their discussion, the duo will address "Transatlantic relations between Poland and the United States." 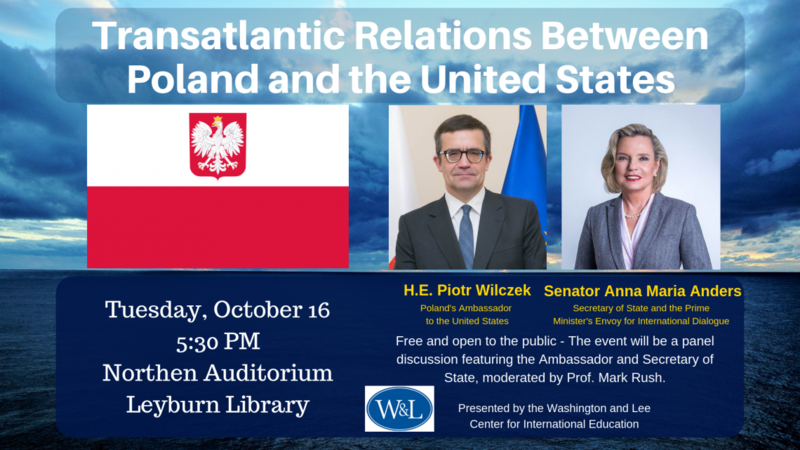 Piotr Wilczek, ambassador of Poland to the United States, and Anna Maria Anders, Polish senator and secretary of state plenipotentiary for international dialogue, will participate in a panel discussion at Washington and Lee University on Oct. 16 at 5:30 p.m. in Northen Auditorium. In their discussion, moderated by Mark Rush, W&L’s Waxberg Professor of Politics and Law and director of the Center for International Education, the duo will address “Transatlantic relations between Poland and the United States.” The event is free and open to the public. Wilczek is a literary scholar, historian, writer and translator. He graduated in 1986 from the University of Silesia in Katowice, where he also received his Ph.D. (1992). Recruited by his alma mater, he remained there until 2008 as a professor and faculty dean. His interests include comparative literature, philology and intellectual history. In 2006, he received the title of professor of the humanities from the president of the Republic of Poland. Anders graduated from Bristol University in the U.K. with an honors degree in modern languages. She also earned a master’s degree from Boston University in the United States. After graduation, she worked in the UNESCO Press Office in Paris (1978–1979), as well as in the oil and real estate industries. Anders has been secretary of state at the Chancellery of the Prime Minister as the prime minister’s plenipotentiary for international dialogue since 2016. This visit is presented by the Washington and Lee Center for International Education.